An introduction to the Avenue of Saints Project, Missouri | Cultural Resource Analysts, Inc.
Over the next week, Andrew Bradbury and Richard Herndon will discuss the Avenue of Saints Project conducted in Lewis and Clark Counties, Missouri, between November 2004 and August 2006. From November of 2004 to August of 2006, CRA conducted archaeological excavations in association with the Avenue of the Saints (AOS) project in Lewis and Clark Counties, Missouri. Our work on the AOS project took us to 55 different archaeological sites. In some cases, our investigations consisted of limited excavations: a backhoe trench or a limited number of test units. For nine of the sites, major excavations were undertaken. The major excavations consisted of removing the plow zone from large portions of sites to expose features (prehistoric pits: hearths, storage, etc.) on shallow sites. During excavations at the Carskadon site Middle and Late Woodland (circa 200 BC to AD 1400) features were exposed just below the plow zone. More deeply buried components were investigated via hand excavations in large block areas. For example, at the Big Branch Fan site where Late Archaic components (circa 3000 – 600 BC) were identified in more deeply buried deposits via hand excavations in large block areas. The time periods examined on the AOS sites represented Early Archaic through Late Woodland (roughly 9200 BC to AD 900) temporal periods. We conducted the work at AOS for the Missouri Department of Transportation (MoDOT). An excellent summary of the archaeological work associated with the AOS project can be found on the MoDOT web site. A number of volumes have been completed that detail the work we conducted at the sites (see the link for more information). 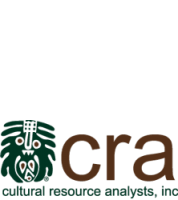 CRA personnel have also presented summary papers at several archaeological conferences and have started preparing papers for professional journals, such as the Missouri Archaeologist.